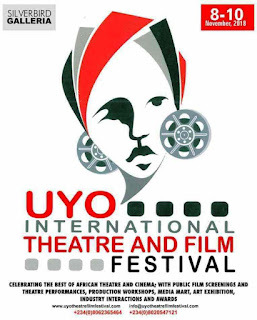 Uyo, the capital of Akwa Ibom State is set to host Nigeria’s first ever theatre and film festival (UTAFF). The event holds from November 8 to 10, 2018. Themed New Talent, New Technology in Theatre and Film Practice, the objective of the festival is to serve as a premier platform for increasing development in indigenous performing and media arts in Akwa Ibom State, thereby impacting positively on the economy of the state as well as promoting Akwa Ibom State tourism and hospitality to the world. The three-day event will feature training, workshop, panel discussion, film screening, theatre performances and awards. UTAFF 2018 will hold at 4 different venues: Silverbird Cinema (Uyo), University of Uyo, Akwa Ibom State Council for Arts and Culture and Akwa Ibom State University (Obioakpa campus). A foremost Akwa Ibom female filmmaker, Emem Isong, will be celebrated at the maiden edition of the festival with her film Ayamma headlining the opening screening of the festival. A command performance of Kasala – a theatrical piece directed by Thompson will also open the theatre performances at this year’s festival. The filmmaker and broadcast engineer, Dr. Don Pedro Agbonifo-Obaseki, will give the keynote while Fidelis Duker, Ekpenyong Bassey-Inyang aka Keppy, Adedayo Thomas, DG NFVCB, Hussein Shaibu, Emem Isong, the President of National Association of Nigerian Theatre Arts Practitioners (NANTAP), Israel Eboh; Moses Eskor, Dr Ofonime Inyang are expected to speak at the festival. His Excellency, Deacon Udom Emmanuel, Executive Governor of Akwa Ibom State, is expected to flag off the festival as the Special Guest of Honour. The Secretary to the State Government, Dr. Emmanuel Ekuwem, Commissioner for Information and Strategy, Mr. Charles Udoh, and Commissioner for Culture and Tourism, Chief Uno Etim Uno would support him. Last week, the UTAFF team paid a courtesy call on the Managment of Akwa Ibom State University, where the Vice-Chancellor of Akwa Ibom State University, Prof. Eno James Ibanga (represented by Prof. Idongesit Isaac) commended the Organizers of Uyo International Theatre and Film Festival for the wonderful initiative. He expressed the hope that participants at the event would benefit from knowing the symbiosis between theatre and film.